Paul Rudd is known for his goofy roles in films like This is 40 and Forgetting Sarah Marshall. Now, he is playing one of the most loveable superheroes in the Marvel universe: Ant-Man. The wealth of actors who have landed roles in superhero films usually skyrockets in the years following the film’s debut. Is that the case with Ant-Man? What is Paul Rudd’s net worth? Paul Stephen Rudd was born on April 6, 1989, in Passaic, New Jersey. After studying theatre at the University of Kansas and the British American Drama Academy, Rudd made his acting debut on the 1990s television drama Sisters. He left the show to appear in the popular film Clueless alongside Alicia Silverstone. By 1999, he was acting regularly and earned his first Screen Actors Guild nod for his role in The Cider House Rules. And, in 2002, he was cast as Phoebe’s boyfriend on the show Friends. Rudd’s real break-through moment was when he first began working with the director and producer Judd Apatow. The pair first worked together on the set of Anchorman in 2004 and then again in 2005 on the set of The 40-Year-Old Virgin, which further propelled Rudd’s career into success. After nearly a decade of appearing and starring in comedies, Rudd was chosen for the part of Scott Lang in the 2015 film Ant-Man. Landing this role has led to additional work for Rudd, undoubtedly (not to mention a second Ant-Man film and Avengers films). 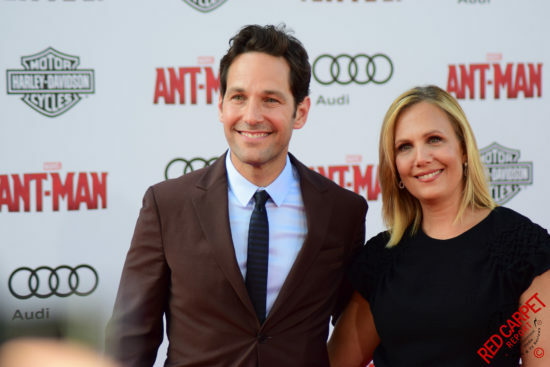 But what has all this success done for Paul Rudd’s net worth? The bulk of his wealth has stemmed directly from the work he has done as an actor and there is no doubt having a superhero role is helping grow his nest egg. Currently, Paul Rudd’s net worth is estimated to be between $15 million and $30 million. Estimates showing Rudd to be worth $25 to $30 million are already taking into account his potential earnings from Ant-Man and the Wasp and his appearances in the 2019 Avengers film. Prior to the release of these movies, his net worth is more likely sitting around $15 million. That $15 million includes his Hollywood home, valued at $12 million. And, in addition to his earnings from films, he has also earned a few million dollars over the years supporting brands like Miller Brewing Company, Nintendo, and Samsung. Another source of income, albeit small, is a small candy shop in Rhinebeck, N.Y. Rudd, his wife Julie, and actor Jeffrey Dean Morgan have partnered with Samuel’s Sweet Shop in Rhinebeck to keep the business afloat after the owner died. The actors both loved the candy shop and couldn’t let it disappear. Their involvement has helped the business greatly and is a source of additional income for Rudd. All in all, Paul Rudd’s net worth is steadily growing with the increasing number of roles he is playing in Hollywood. Don’t be surprised if you begin to see him in more commercials, television shows, and movies in the near future. Readers, are you going to see Ant-Man and the Wasp this weekend?